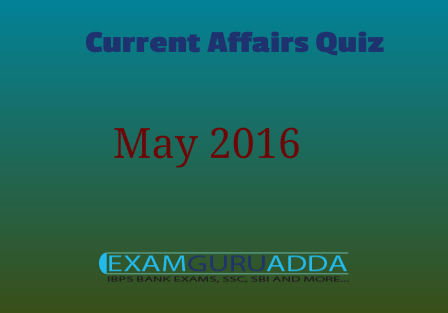 Dear Readers Examguruadda.in presents Current Affairs quiz of 23 May and 24 May 2016 that cover important current affair events. Current Affairs quiz prepared according to the latest Bank, SSC and other competitive exams. 1 Who was sworn-in as the Chief Minister of Assam? 2. Who was sworn-in as Tamil Nadu Chief Minister for sixth time? 3. Who was appointed as the Lieutenant Governor (LG) of Puducherry? 4. Proposed Postal Payment Bank will be operational from.......? 5. Which State has launched Smart Village program to improve public facilities in the villages? 6. International Day for Biological Diversity was observed on which date? 7. Who was conferred with the Yug Kavi Siddhicharan Award, one of the Nepal’s prestigious literary award? 8. Name the fast attack craft was commissioned into Indian Navy? 9. Who was appointed CMD of Nuclear Power Corporation of India? 10. Who has won the 2016 Indian Federation Cup football tournament title for the 14th time? 11. Who became the first cueist in the world to hold both world and continental titles in 6-red snooker at the same time? 12. Name the India’s first reusable space shuttle?